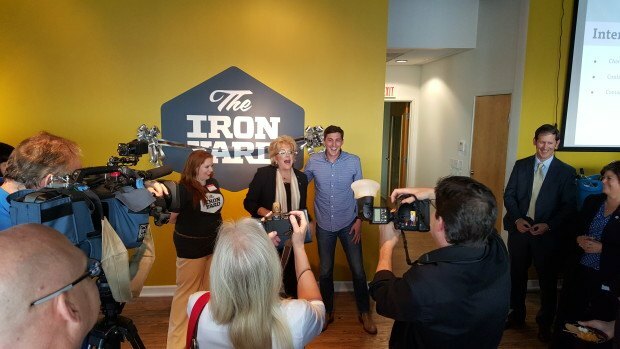 Mayor Goodman, The Iron Yard co-founder Eric Dodds, and the Las Vegas community marked the opening of the The Iron Yard in Las Vegas on August 19, 2015. The Iron Yard provides immersive code education for adults and kids, mentorship and capital for startups, co-working spaces and the value-generating relationships that will help them succeed personally and professionally. Mayor Carolyn Goodman took part in the ceremony at the facility on South Casino Center and Charleston boulevards. City officials say the training center could help fill a need for local entry-level code developers. The Iron Yard was founded in 2012 and is headquartered in Greenville, South Carolina. The new Las Vegas Arts District campus is one of 20 in cities including London, Atlanta, Houston, Salt Lake City and Washington, D.C.
Looker says those in the community who are interested in a new career should apply to The Iron Yard. “If you work in the industry even in a support role like Project Management or IT please reach out. We’d love to have you come in and chat with our students and share what you do,” Looker added. For more on the opening, visit VegasStartups.com.